According to offensive line coach Mike Cavanaugh, Thursday was a bit of a blip in what has otherwise been a”damn good” camp for the Huskers up front. “I just didn’t think we had that frickin’ intensity that we need, so I jumped their butts down there after,” Cavanaugh said. Cavanaugh wants to see more consistency out of his unit, although offensive coordinator Danny Langsdorf did say the group was making progress. Cavanaugh praised new defensive coordinator’s Bob Diaco’s defense and said the 3-4 gives the offensive line a great opportunity to work against many different looks. 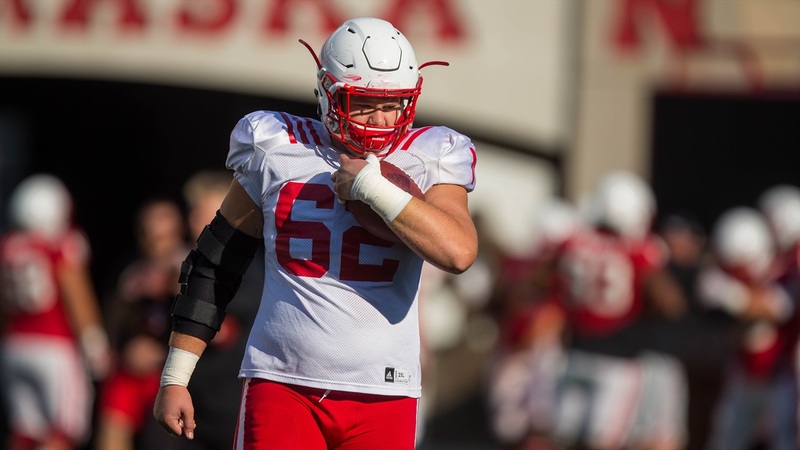 The offensive line is going to have to be ready for everything this season as Langsdorf said he is striving to have a balanced offense that can both run and pass depending on what the situation calls for. The most notable bit of news to come out of Thursday’s post-practice was that Cavanaugh has called the center battle in favor of Cole Conrad over Michael Decker. >> While the center battle has been called, the running back one is still very much ongoing. Langsdorf said it is going to be difficult to make any solid decisions until they see the backs perform under true game-like situations with full contact. >> Langsdorf provided his weekly update on the quarterback position, which was a both positive and negative. And of course, he was asked specifically about the battle for the back-up job between Patrick O’Brien and Tristan Gebbia. >> The highlight of the day was a juggling one-handed catch deep down the field by freshman wide receiver Tyjon Lindsey, sandwiched between two defensive backs. Lindsey made catches all over the field and also showed his speed on a jet sweep or two. Langsdorf said it was one of the better practices of the fall for the newcomer.